In a measure designed to reduce the power of the church and open the rich mission lands to colonization, the Mexican Congress passed a secularization bill in August 1833. Advocates of the law could point out that more than fifty years of the friars’ teaching—the inculcation of Christian civilization and the rudiments of agriculture and industry—could be considered adequate to prepare the Indian converts for self sufficiency. 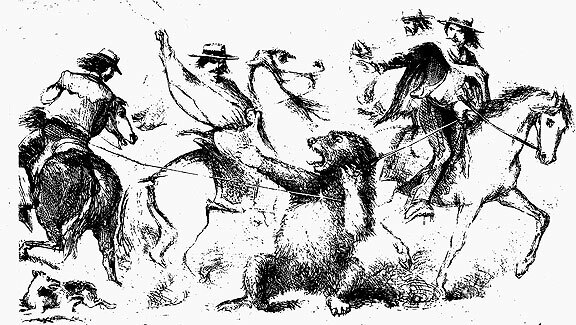 At each of California’s twenty-one missions, an administrator “would give to every adult male Indian a tract of twenty eight acres; his fair share of one half of the domestic animals and tools of the Mission.”24 The appearance of liberality, however, only thinly concealed the wholesale looting of mission property, as the departing friars and newly appointed administrators strove to prevent each other from self-enrichment by appropriating what they could. Between the announcement of the new policy and the appointment of the local administrator, the 5,000 cattle at Mission San Francisco de Assisi were driven away, while the few remaining Indians simply walked away. The secularization of the missions set off a wave of Mexican land grants in California under a process that dated back to an 1824 law, the Law of Colonialization. The procedure was a simple one in which the petitioner asked the governor of Mexico for a specific tract of empty land. This written request was frequently accompanied by a diseño, or map, prepared locally by a rough ground survey. If the petitioner had performed some service for the government, such as being part of the army, the claim was generally granted. Since the act aimed to encourage settlement, land grants were made to petitioners of foreign origin as well, provided they formally adopted both the Catholic faith and Mexican citizenship; many of these petitioners married the daughters of Mexican families. Two families laid claim to most of the land of the Potrero—the Bernals and the de Haros. ‘Potrero’ translates from Spanish to “pasture.” San Francisco had two potreros: The Bernals claimed the Potrero Viejo (old grazing lands that extended from Islais Creek south to Hunters Point) and the de Haros claimed the Potrero Nuevo (new pasturelands appropriated from the Mission and around Mission Bay to Potrero Point). 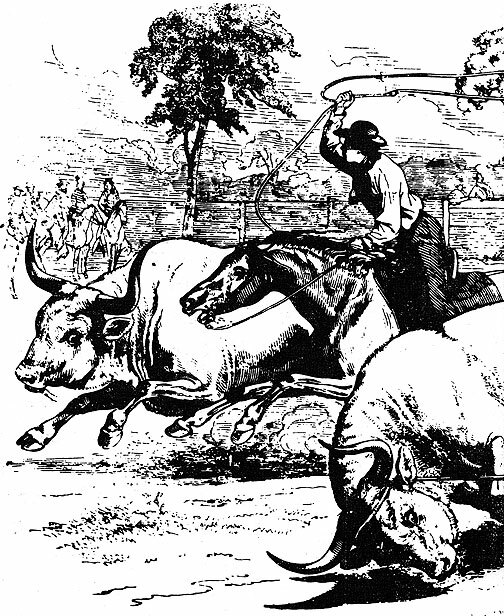 Vaqueros lassoing cattle. 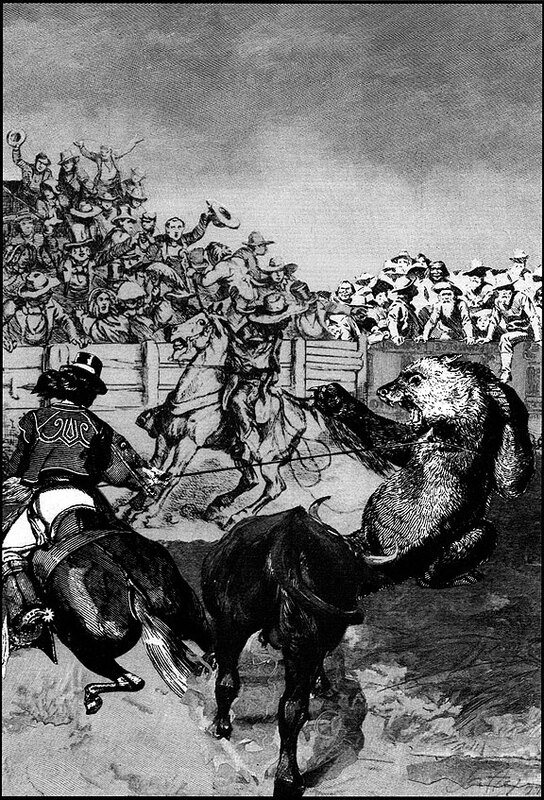 “All of the cattle were branded, and each rancho had ear-marks. . .Owners of adjoining ranchos came to the rodeo grounds to select their own cattle and brought with them their own vaqueros who went in and picked out the cattle belonging to their special ranchos. The work of separating the cattle, while a necessity, was really more of an amusement than a labor. . . it was an opportunity to exchange greetings and talk over affairs.” —William Heath Davis, Sixty Years in California, 1831 to 1889. But all was not so peaceful as most accounts would have us believe. John Vioget’s tavern, the only public house in Yerba Buena village in the 1840s, became the center for drunken brawls between Mexican-Californians and outsiders. Jose C. Bernal was called up several times in two years for drunken fights and knife stabbings. The de Haro twins were sentenced to serve six months in jail in San Jose for wounding Captain Elliot Libbey, master of the bark Tasso, who had made advances to a young lady much beloved by “Chico” de Haro. These incidents (recorded by the juez de paz) demonstrated that Mexican-Californians were not able to accept with equanimity the idea that Yankees appeared to be in California to stay, to marry their daughters and settle on their land. Both Jose C. Bernal and Francisco de Haro served the Mexican government in the army. Bernal was a soldier at the presidio, born of a soldier, Juan Bernal, who had accompanied Anza to Monterey in 1776. Both father and son were stationed at the presidio and both kept cattle and sheep as a second occupation. Bernal’s first petition to the Rincon de las Salinas y Potrero Viejo (“the corner of the salt marsh and the old grazing lands”) was rejected on grounds that the land was common grazing land, but he persisted and his claim was confirmed in 1840. After raising the American flag at the Customs House in Monterey on the morning of July 7, 1848, Commodore John Sloat promised the assembled Mexican-Californian population, “All peoples holding titles to real-estate, or in quiet possession of lands under color of right, should have their titles and rights guaranteed to them.” 31 By July 11, acting under Sloat’s orders to Commander John B. Montgomery, the American flag flew over San Francisco and, to the north, over Sonoma and Bodega. American possession of California was a fact, and Sloat’s promise to the Mexican-Californians lay on the future of the land. Meanwhile the government in Washington had directed General Stephen W. Kearny to establish a temporary civil government with himself as provisional military governor. The limits of Kearny’s authority were at once sweeping and vague; his charge was to maintain order. This is chapter three of "Vanished Waters: A History of San Francisco's Mission Bay" published by the Mission Creek Conservancy, and republished here with their permission. 24. J.S. Hittell, History of San Francisco, 70. 25. Robert H. Becker, Diseños of California Ranchos, Maps of Thirty-seven Land Grants (1822-1846), (San Francisco: Book Club of California, 1964), xxii & xiv. 26. Rev. Walter Colton, My Three Years in California, 216. 27. Bancroft, History of California, vol. 3:698. 28. Rev. Walter Colton, Three Years in California (Stanford: Stanford University Press, 1949), 222-223. 29. Rare documents, Spanish-Mexican legal documents, Bancroft Library; William Heath Davis, Sixty Years in California, 1831-1839 (San Francisco: A.J. Leary, 1889), 199-200. 30. Francisco de Haro bought the Rancho Laguna de la Merced from Antonio Galindo for 100 cows and 25 dollars in goods. Galindo’s grant had been first made on the San Francisco peninsula. The de Haro claim that made its way through the United States courts until 1868 was for the Potrero lands granted to the de Haro twin boys in 1834. William Crittenden Sharpsteen, “Vanished Waters of Southeastern San Francisco,” California Historical Quarterly, vol. 21:120. 31. Antonio Berreyesa Recollection, dictated to Don Emilio Piña, translated by Thomas Savage for H.H. Bancroft, Bancroft Librarv. 32. Theodore Hittel, History of California, vol. 1:464-465. 31. Bancroft, History of California, vol. 5:563-564. 33. The first sale took place on July 20, 1847; 250 water lots in Yerba Buena Cove were sold at prices from $50 to $600, mostly at or near the higher figure. “The lots between Clay and Sacramento, reserved for possible use by the government, were sold six and a half years later, and brought $12,000 each, on an average-more than one hundred times as much as in 1847.” J.S. Hittell, History of San Francisco. 114.